A variety of methods exist to constrain sub-volcanic storage conditions of magmas. Petrological, seismological and satellite geodetic methods are integrated to determine storage conditions of peralkaline magmas beneath Dabbahu Volcano, Afar, Ethiopia. Secondary ion mass spectrometry (SIMS) analysis of volatile contents in melt inclusions trapped within phenocrysts of alkali feldspar, clinopyroxene and olivine from pantellerite obsidians representing the youngest eruptive phase (<8 ka) show H2O contents ≤5.8 wt.% and CO2 contents generally below 500 ppm, although rarely as high as 1,500 ppm. Volatile saturation pressures (at 679–835°C) are in the range 43–207 MPa, consistent with published experimental data for similar pantellerites, which show that the phenocryst assemblage of alkali feldspar + cpx + aenigmatite ± ilmenite is stable at 100 to 150 MPa. Inferred magma storage depths for these historic eruptions are ~1–5 km below sea-level, consistent with the depths of earthquakes, associated with magma chamber deflation following a dyke intrusion in the period Oct 2005–Apr 2006. Interferometric synthetic aperture radar (InSAR) data for the same period reveal a broad ~20 km diameter area of uplift. Modelling of different geometries reveals that a series of stacked sills over a 1–5 km depth range best matches the InSAR data. 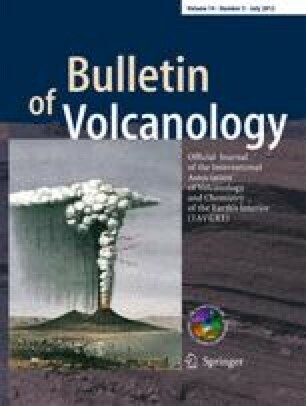 The consistency of depth estimates based on petrological study of ancient eruptions and the seismicity, inflation and deflation of Dabbahu observed in relation to the dyking event of 2005, suggest a small but vertically extensive and potentially long-lived magma storage region. The online version of this article (doi: 10.1007/s00445-012-0580-6) contains supplementary material, which is available to authorized users. This work has been supported by the Natural Environment Research Council, Afar Rift Consortium grant NE/F007604/1. The authors acknowledge the generous support of the University of Addis Ababa with fieldwork arrangements, particularly E. Lewi and A. Ayele, and the Afar Regional Government for invaluable assistance. Detailed Dabbahu earthquake data were kindly provided by C. Ebinger. The authors gratefully acknowledge technical assistance provided by S. Kearns (EMPA), R. Hinton and J. Craven (SIMS), N. Marsh and R. Kelly (XRF) and thorough reviews by J. Lowenstern and R. MacDonald.